Kad Boon Lai market with live music re-opened at Suriwongse Hotel. This Hotel’s outlet has returned to Chiang Mai for the high season. The hotel, located at the Night Bazaar, is promoting the market for tourists and residents to visit. With live music, all kinds of food and drink like local Lanna delicacies, sushi, herbal teas and smoothies, the hotel feels sure that the market will be enjoyable for all. The newly -opened outlet will be open every Friday from 6 pm. to 10 pm. Here Chumporn Saengmanee, seated 3rd left, Chiang Mai’s Deputy Governor was one of the guests who attended and presided over the opening ceremony on Friday, November 13. 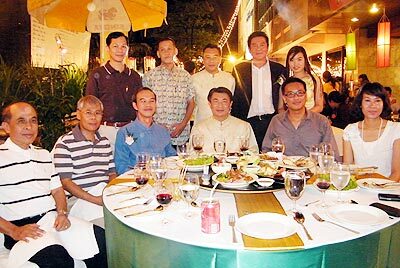 With him, was Winai Jittaratseni, seated 3rd right, General Manager of the hotel and guests of honour. The Dusit D2 Chiang Mai Hotel hosted a fashion show from the Ginger line of clothing at the hotel’s Moxie Restaurant and an auction to raise funds for the Viengping Children’s Home. 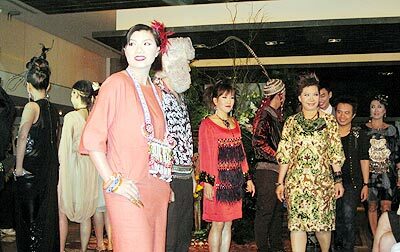 Local society, both foreign and Thai, were invited along with the media to enjoy the show with Chiang Mai VIP’s modeling the clothing line designed by Apichart Sichan, Kawin Panfai and Worachet Kapuak. Along with the accompanying tea-party was the benefit auction of fashion accessories, clothing, furniture and decorative goods on Monday, November 16. The Viengping Children’s Home takes care of orphaned children under the age of 6 and was the first orphanage in the country to take in HIV affected children.